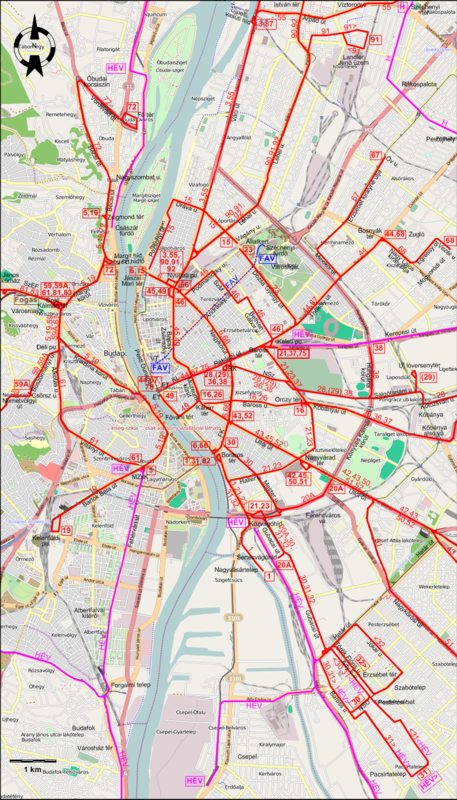 The Budapest tram network on the eve of Christmas 1945. 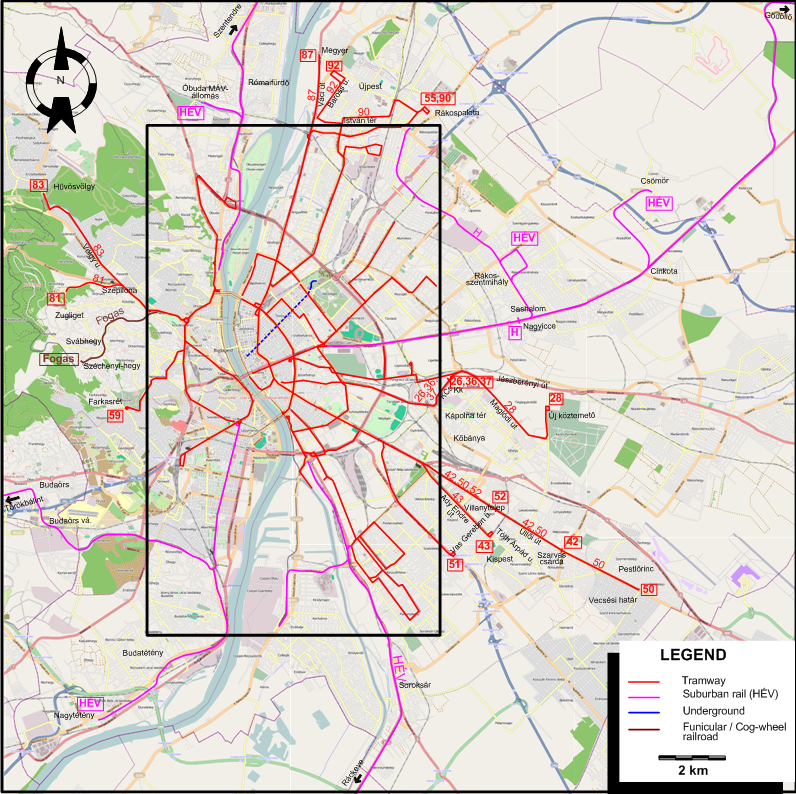 With all the bridges across the Danube destroyed during the war, there were two networks, providing a basic service to a highly damaged city. ET Eskü tér NSU Nagy Sándor u. 15 Rudolf tér (Jászai Mari tér) - Pozsonyi út - Dráva u. - Dózsa György út - Vágány u. 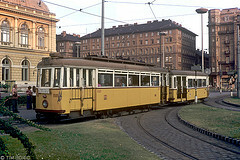 19 Zsigmond tér - Margit krt. - Széll Kálmán tér - Déli pu. [South Station] - Krisztina krt. - Bartók Béla út - Kelenföldi pu. 30 Ferenc körút - Mester u. - Gubacsi út - Baross u. [Back: Ady E. u.] - Pesterzsébet, Nagy Sándor u. 43 Nagykörút - Üllői út - Nagyvárad tér - Üllői út - Ady Endre út - Kispest, Tóth Árpád u. 59A Széll Kálmán tér - Déli pu. [South Station] - Böszörményi út - Csörsz u.
Császár fürdő - Óbuda va. Suburban rail (excluding tracks shared with the tramway): 120.3 km. Tramway (horse-powered): 30 July 1866 - 10 Apr. 1928. Tramway (electric): 28 Nov. 1887 - today. Suburban rail (steam): 1887 - 1914. Suburban rail (electric) - 1897 - today. Cogwheel rail (steam): 24 June 1874 - Nov. 1927. Cogwheel rail (electric): 2 July 1929 - today. Millennium underground (M1 line) (electric): 2 May 1896 - today. Modern underground (M2/M3 lines) (electric): 3 Apr. 1970 - today. 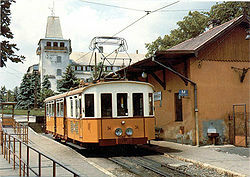 Funicular (cable-operated): 2 March 1870 - Dec. 1944 (destroyed during the siege of Budapest); 4 June 1986 - today. The Magyar Műszaki és Közlekedési Múzeum (Hungarian Technology and Transport Museum) in the Városliget (City Park of Budapest) has several old trams on display. 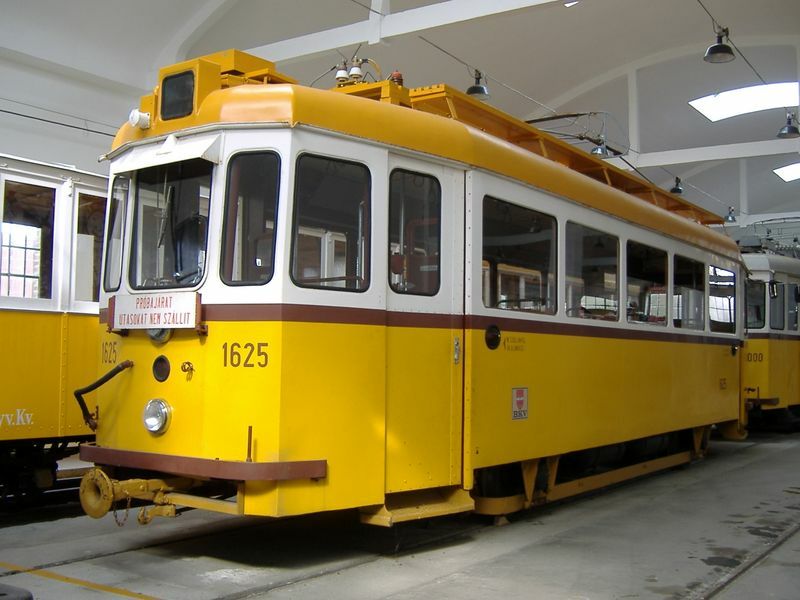 The Városi Tömegközlekedési Múzeum (Museum of Urban Public Transportation) in Szentendre, north of Budapest, has a larger collection of heritage trams, and also runs some of them on its museum tracks. A főváros tömegközlekedésének másfél évszázada. [One and a half centuries of public transportation in the Hungarian capital] (3 vols.). 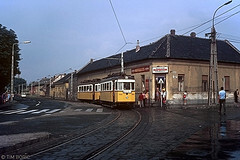 Budapest: BKV, 1987. "Budapest's transport renaissance - A special review", Tramways & Urban Transit, Sept. 2014 (77: 921), p.373-387. Horn, G., Varga, Z. & Fodor, I. "Budapest: Rebuilding one of Europe's largest tramways", Tramways & Urban Transit, May 2013 (76:905), p.188-191. Jenkins, M. "Hungarian rhapsody: Part 1: Budapest - The metro takes its toll; Part 2: The Budapest urban tram system", Modern Tramway & Light Rail Transit, Jan. & Apr. 1980 (43: 505 & 508), p.11-14, 119-129. Legát, T. Közlekedik a főváros [The capital is on the move]. Budapest: Jószöveg Műhely, 2008. Legát, T., Nagy, Zs.L. & Zsigmond, G. Számos villamos [Tram with a number]. Budapest: Jószöveg Műhely, 2010. Legát, T. & Zsigmond, G. Közlekedik a székesfőváros [The country's capital is on the move]. Budapest: Libri, 2014. Lesley, L. "The future of Budapest tramways", Modern Tramway & Light Rail Transit, June-July 1988 (51: 606-607), p.212-218, 233-239. Russell, M. "Classic trams Budapest - Old trams ... new role", Tramways & Urban Transit, Nov. 2009 (72: 863), p.444-445. Russell, M. "Classic trams: Budapest - Hungarian 125th anniversary", Tramways & Urban Transit, Feb. 2013 (76: 902), p.76-77. Streeter, T. "Budapest: Modernisation and expansion in a tough climate", Tramways & Urban Transit, May 2011 (74: 881), p.174-176. 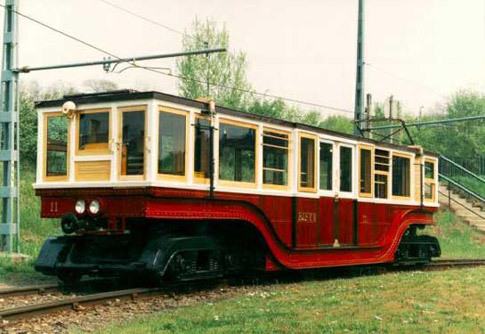 Szabó, D. "Reshaping Budapest's tramway network", Modern Tramway & Light Railway Review, Apr. 1973 (36: 424), p.121-122. Szedlmajer, L. & Fodor, I. 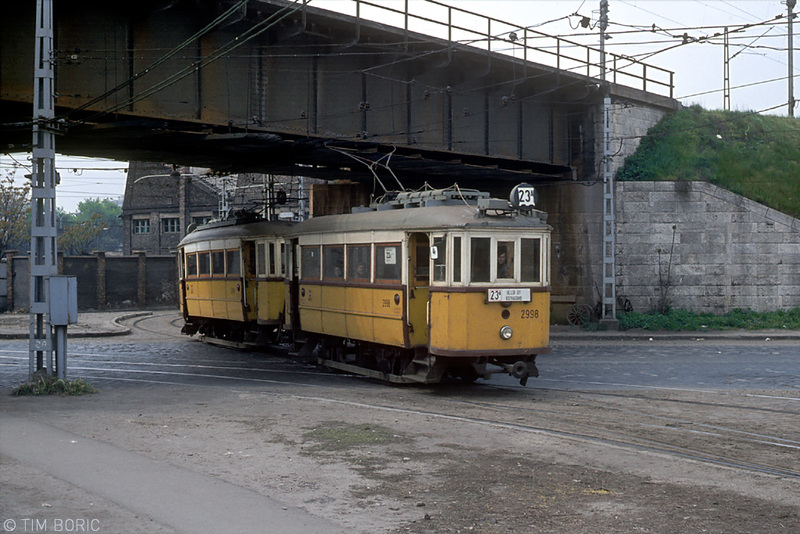 "Budapest: The lessons of mixed tram fleets", Tramways & Urban Transit, Apr. 2012 (75: 892), p.149-152. Varga, Á.E. "Budapest: Trams versus economic reality", Tramways & Urban Transit, Dec. 2003 (66: 792), p.455-457. Várnagy, Z. A budapesti helyiérdekű vasutak története. [History of the Budapest suburban railways.] Budapest: Budapesti Közlekedési Vállalat, 1987.